Elevator balancing strap are ready stock. Rubber strip with both side metal ring. 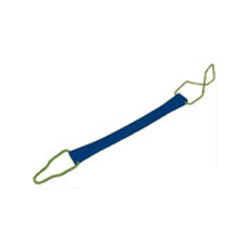 These straps are characterized by a simple design, comprising of tongs connected by a highly stretchable strap. Offered straps perform their function of repositioning makeup and breakout tongs effectively and have been designed to last long. Manufactured using high grade materials, the offered pull back straps are in strict compliance with international quality standards. Looking for Elevator Balancing ?